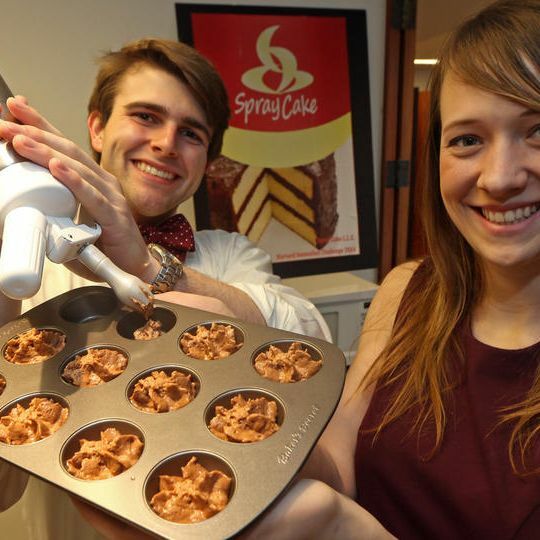 It shouldn’t come as much of a surprise that people are way excited about Spray Cake, an aerosolized can of on-demand organic cake batter invented by two Harvard undergrads, Brooke Nowakowski and John McCallum. Its instructions are simple — “Just add heat” — and the product stays “fresh,” meaning you can have insta-cupcakes for weeks if you ration it out. Cakes cook in a minute and cupcakes take less time; you can use the microwave or a conventional oven and it’s really that simple, as the start-up’s ad demonstrates through the power of interpretative dance. “Honestly we were kind of surprised it hadn’t been done before,” Nowakowski humble-brags, and the pair, who’ve moved to patent the product and have already found a business partner, say the cake has the mouthfeel of the traditional stuff, but skeptics should keep in mind their idea perhaps wasn’t so hard to perfect — in fact, it already was. While Spray Cake’s advance marketing may zero in on millennial bachelors and harried moms, the idea of ready-made, microwavable sponge cake batter dispensed from an iSi Profi Whip or some other gas-charged canister is actually a page ripped straight out of the modernist food playbook. This may be the first time insta-cake has been marketed to consumers, but Albert Adrià was whipping the stuff at el Bulli (and on No Reservations) back in the aughts; fans of David Chang, Wylie Dufresne, and Grant Achatz have no doubt eaten them during the dessert course, and several variations have even been tweaked by home gastronauts. Those recipes may involve a lot less dancing, but most of them do cook in about twenty fewer seconds.